Last week was pretty awesome — we had a huge “new tools” conference here at Monterey with all kinds of cool space and tech companies like Airbus. 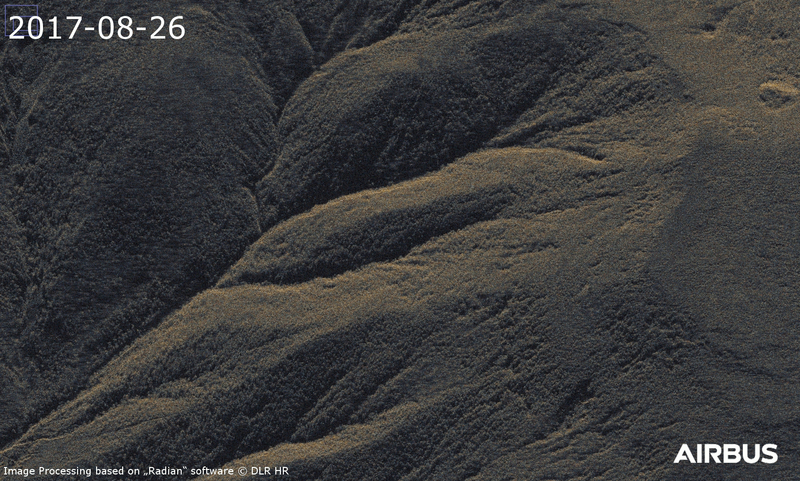 We have a great relationship with Airbus, which made available a pair of images taken with synthetic aperture radar of North Korea’s nuclear test site before and after the most recent nuclear test. SAR is cool. You can see that the explosion visibly displaces the mountain, which demonstrates both how large the explosion was but also that it occurred in the same tunnel complex as the preceding four nuclear tests. This is useful because the relationship between the size of the explosion and the magnitude of the seismic signals is sensitive to the overburden — how much rock is above the explosion. On 3 September 2017 at noon, local time, North Korea conducted its sixth nuclear explosion at the Punggye-ri Nuclear Test site. The magnitude of the explosion, as measured by seismic stations around the world, was an order of magnitude larger than past tests. The CTBTO estimates the size of the explosion, using the magnitude moment scale, at 6.07. The explosion was powerful enough that a secondary seismic event was detected, probably related to a collapse of the cavity created by the nuclear explosion. While seismic signals can tell us about the size of the explosion, determining the location of the explosion is much more difficult. It is, however, possible to use Synthetic Aperture Radar (SAR) satellites to observe environmental changes as a result of this explosion and to locate where the explosion may have occurred. Radar satellite imagery, collected by the TerraSAR-X satellite, reveals a major ground disturbance and subsidence of the peak of Mount Mantap. This suggests that the explosion occurred within the tunnel complex at Mount Mantap, where North Korea also conducted its most recent four nuclear tests in 2009, 2013 and 2016. Unlike conventional satellite imagery which measures visible light, radar satellites measures X-band microwaves, which can detect geo-precise surface changes when collected and processed together. The German TerraSAR-X satellite uses X-band microwaves with a 3.1 cm wavelength, which in this case, provides 1 meter spatial resolution of the targeted site, however, due to the short wavelength, does not penetrate trees and other vegetation enough to measure the exact earth subsidence. Airbus, the owner of the commercial exploitation rights of the satellite, tasked TerraSAR-X to record imagery of North Korea’s nuclear test site at Punggye-ri before and after the 3 September nuclear test. The satellite imaged the nuclear test site from the same orbital position on differing dates resulting in a pair of geo-precise images from 26 August and 06 September 2017. Preliminary imagery interpretation concludes the peak itself of Mount Mantap has incurred a visible amount of subsidence; and over 85 acres of the southwest flank of the mountain was displaced by several meters. The image pair was overlaid and compared; revealing significant changes at Mount Mantap’s peak elevation. Prior to the test, Mount Mantap was 2,205 meters high; the mountain has since diminished in height. This subsidence suggests that North Korea conducted yet another test in the tunnel complex under Mt. Mantap despite excavation continuing on an additional tunnel complex to the west of the support area. The subsidence also demonstrates the magnitude of the event. Similar images were collected before and after North Korea’s January 2016 nuclear test but showed no such ground disturbance. Previously, optical satellite images from Planet Labs had shown localized landslides in the Mount Mantap’s fluvial plain around the Northern Test Portal at Punggye-ri . * Yield estimation for a nuclear explosion at Punggye-ri, DPRK is done using the formula: Mb = 1.0125 log (Y) – 0.7875 log (H) + 5.887, where the depth of burial (H) is in meters and the yield (Y) is in kilotons. See: Miao Zhang and Lianxing Wen, “High-precision location and yield of North Korea’s 2013 nuclear test,” Geophysical Research Letters, vol. 40, 2941–2946.